We have been learning about Clothes. We have conducted STEM experiments on different materials and fabrics. We have looked at special clothes that represent our different cultures and interests. We have designed our own t-shirts and used fabric markers to watch our designs come alive! A Healthy Life Needs A Healthy Diet! 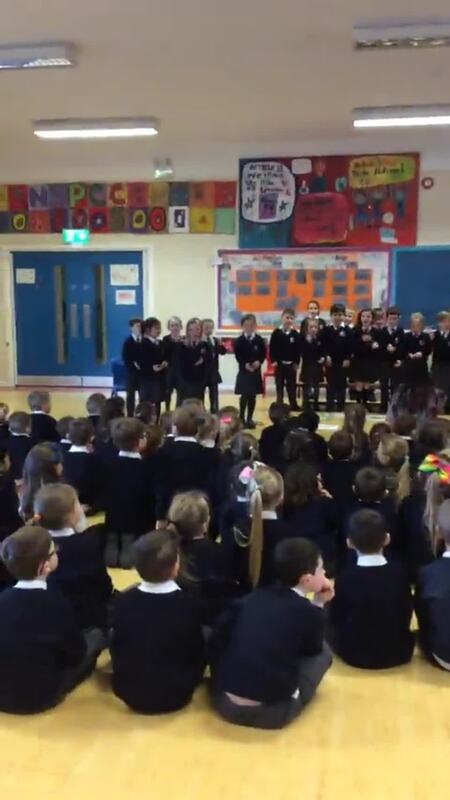 A huge Well Done to all the boys and girls who performed in our class assembly on Healthy Eating! story of the Very Hungry Caterpillar! Congratulations everyone! We have been learning to recognise 1p, 2p, 5p and 10p coins. We have also been learning how to make amounts of money using 1p and 2ps coins. Well done to the boys and girls in Primary 2, who are on their way to being financially capable! We were learning about food on the farm! P2JH made their own butter by shaking double cream very, very fast! We watched the liquid cream turn to solid yellow butter. We tasted our butter on crackers, it was delicious! We have been learning about speech marks. We have retold the story of Farmer Duck through the use of speech bubbles. We recorded our ideas using easi-speak microphones and typed our own sentence onto Microsoft PowerPoint. On this page you will find monthly updates about our learning and experiences in class. During September, we have been settling into Primary 2 and practicing new routines. Here are a selection of photographs from our Outdoor learning.